As you said, Bob. When you mix Steven Spielberg with John Williams and a half-decent premise, you get some damn fine movies. Also, it's nice to see you talking about a movie that's going to be an Oscar favorite come March without all the snark and irony that The King's Speech so rightly deserved last year. Side note: If anyone has a chance to see the original play. Do it. That thing is amazing. Good to see that the film lives up to it. Awww... With it opening on a Tuesday, I really hoped this video would be about The Girl With The Dragon Tattoo. Not even a word on it during the credits? Next week; Be there or be square. I was hoping for Girl with the Dragon Tattoo, but hey as long as this isn't just Oscar bait. Black Beauty meets the Warriors: that does sound pretty cool actually. Good review- but Bob, my patience wears thin. Tinker Tailor Soldier Spy- NOW, DAMNIT. I KNOW HOW TO MAKE BOMBS- ATOMIC BOMBS! I'm kind of disappointed you didn't do Dragon Tattoo, Bob. I guess War Horse must really be that good. ...What? Are you being sarcastic? Germany did have tanks in WW1. OT: Read the book by Michael Morpurgo a couple years ago and really liked it. Wasn't sure if it would work as a film, but glad it has, might catch it this Christmas. Another great Christmas release film - Children of Men, a few years ago. Catch it. "Alvin and The Chipmunks: Why do you keep doing this to me?" Why? Because 650 million dollars in profit, that is why. Not gross, not estimated, but net profit (not even counting merchandising). About War Horse, I might give it a try. I know its The Black Stallion with even more easy sentimentality bordering on manipulation, and all my cynicism makes me think it won't live up to expectations; but I also believe its going to be around this awards season as the Oscar bait it is, so I guess I should preemptively see it. Germany had tanks in WWI. Now tanks only entered the battlefield in 1916 and Germany never really had that many but they did exist. Germany did have tanks in WW1, though most of them were captured British tanks. "I'm as guilty as any other critic of being reflexively resistant to sentimental and emotional manipulation." AHAHAHAHAHAHAHA, oh Bob... you really crack me up. That was the funniest joke I've ever heard from you. I really hope it was a joke though. You haven't forgotten the cheap exploits of Toy Story 3 already? You know, the ones you totally fell for. I really don't like these types of movies, so I'll pass. Mainly because I know they will work on me, I don't like that feeling. "Whatever you're having, have a happy one" is my new holiday slogan. So thanks for that. I honestly want this to fail just because it's being nominated for awards before it's getting released into theaters (at time of posting), but I'm sure it won't because pretty much everything Spielburg touches turns to gold. You know whats a truly great Christmas/holidays present. Was, like many other it would seem, hoping for a different movie, but that it was actually worth watching is a great surprise. I did however make the mistake of watching this with my horse-loving GF, and guess what we're doing for X-mas! Still, if it's as good as you say it is, awesome. More to the topic, I've been looking for a good World War I movie for quite some time. Maybe this will work. I've literally seen nothing on this movie, but what I saw there looked damn good. I like to think of myself as a hardened cynic, but I have no defense against happy moment crying. I'm sure that if I watched this, I'd end up a blubbering mess just like evewryone else. I liked at first too, but what about if I'm having crack?! Anyway, not going to pay to see this in theater. It's a rent for me. Cos I'm also cheap. I'll take Bob's word that it is a good movie, but given that I despise animal-driven narratives, especially ones that under any other director would be classified as Oscar-bait, I'll probably pass on this one. I can't wait for this. I've seen the stage show and it is amazing, made me cry. I'm hoping this film does the story justice. I'm afraid after "The War of the Worlds", simply hearing the name of Spielberg does NOT make me believe the film will be instantly fantastic. 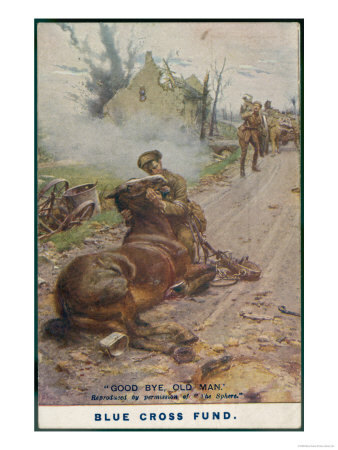 As it happens I work for The Blue Cross, a British animal charity who were involved in both WW1 and WW2 caring for the animal victims of war, especially the horses. The name "Blue Cross" was in response to the human's "Red Cross." We own this original painting and it hangs in one of our animal hospitals in London. OMG this. So much this. I couldn't find the words to describe what I wanted to express without being unjustifiably negative. So, thank you sir and have a good day. My final essay this last semester for my literature class was essentially about how movies no longer seem to tout themselves as a "tragedy" anymore. A good movie may contain tragic elements, as well as a healthy variety of other emotions, but it used to be that the device was an entire genre in itself in the same way that movies that make you laugh are called comedies. Nowadays, we don't see movies advertised as "tragic" very much, if at all. I don't know how War Horse ends and so I don't know whether it's technically a tragedy, but it seems like it fits the genre better than anything to come out in a long time, and it's nice to know that the form isn't dead entirely, even if it's not marketed. There's jokes to be made here about how FiM fans will react to this, but I'm not going to (I can't think of anything). Hopefully, this means Dragon Tattoo will be the new year's show. To be honest, I would have been more surprised if Spielberg made a bad movie. The man is a genius. Probably one of the best Directors of our age, if not the best. I don't think I've ever seen a bad Spielberg film. He's just that good. Well, my mom wants to go see a movie for her Birthday (the day after Christmas) and she loves horses. Guess I know what I'll be watching. Seems like a movie worth checking out. And I'm not surprised since Spielberg is at the rudder most other probably wouldn't pulled it of but it seems like he did.. Girl with Dragon Tattoo is just the remake of a movie that was already great, release less then 3 years ago. Going to see it, if you already seen the original could be likely to leave a bitter taste. Would be fine if it was a case like "Yojimbo" to "A Fistful of Dollars", where they keep about the same plot but switch everything else, but this case is basically just cloning with big name and the bigger budget. And this case is also the first case of such Trilogy remake has a whole, that I know off, since they are indeed going for the whole thing. I am pretty sure the Swedish are been piss right now, for the original release is the Swedish equivalent of Star Wars original trilogy for their movie industry, money that just came out of nowhere, for the first movie completely shattered the old international box office record of a Swedish movie by a factor of like 7 I think. I think I'd have to approach this one with caution. I find almost anything set in WW1 to be very effective at tugging the emotions, and Spielberg is really good at that sort of thing. I'd definitely have to be in the right frame of mind for it though. That said, I doubt anything will ever surpass the last 5 minutes of Blackadder Goes Forth* for WW1 heart rending. *and for anyone unfamiliar with that show, yes, it's a comedy. In a war where thousands upon thousands of human beings who didn't want to be there and weren't affected by the outcome just as much, I can't imagine giving a damn about a horse. Even if the orchestra is pulling for him. Does the movie close with the horse coming home, embittered by war, to write a taut yet revealing look at the horrors of war? It's a goddamn HORSE! I saw the play while I was in London, and it was amazing and heart-string-plucking with the life size puppets/marionettes(? I forget the proper word). After seeing it on stage and subsequently hearing that the movie was being made I was doubtful about how well it could be done. It's good to hear that it is a good movie. Old school, that's just fine because there are a lot of old elements to film making that I've been missing lately so I'll gladly take a film that isn't from the current mold of movies. Heck I'll even gladly take the old heart string tugging because after so many movies of stuff just blows up who cares about the characters it will be nice to have a little action where you care about the protagonist. Just glad I'm seeing the film alone because I grew up around horses so I'll likely be crying like a little kid watching Old Yeller. The play is amazing, hope this is too. One note Bob: It's not set in Ireland, it's set in Devon.